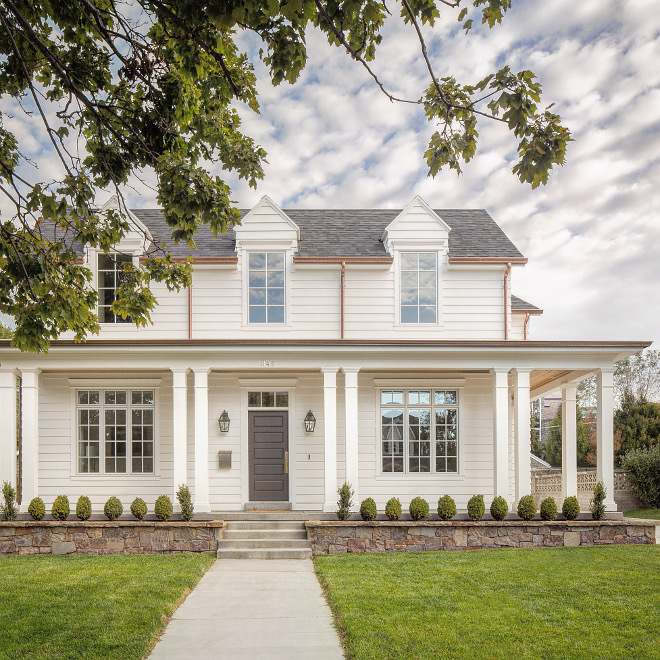 The clients of The Fox Group – a well-known building company from Utah – wanted a white farmhouse that would fit in with their very traditional neighborhood which is filled with English Tudors and gorgeous traditional and colonial homes from the 1930’s. 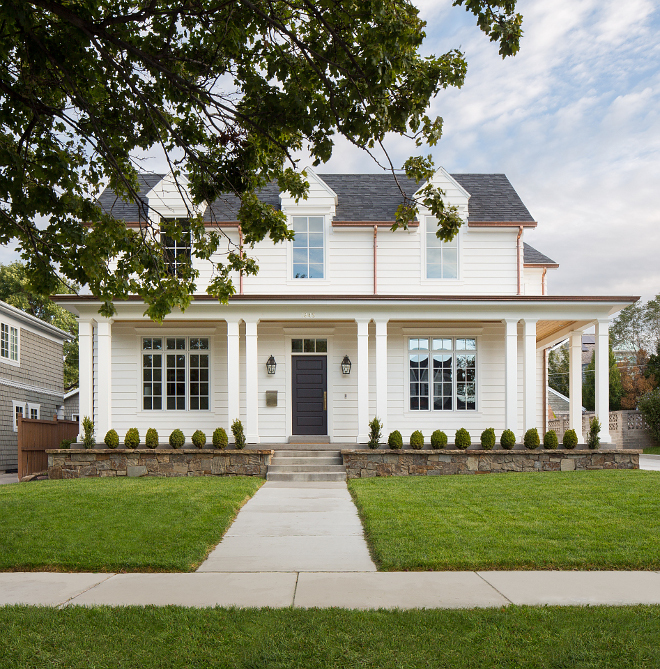 They designed the house to fit both their needs and to also fit the style of the neighborhood. 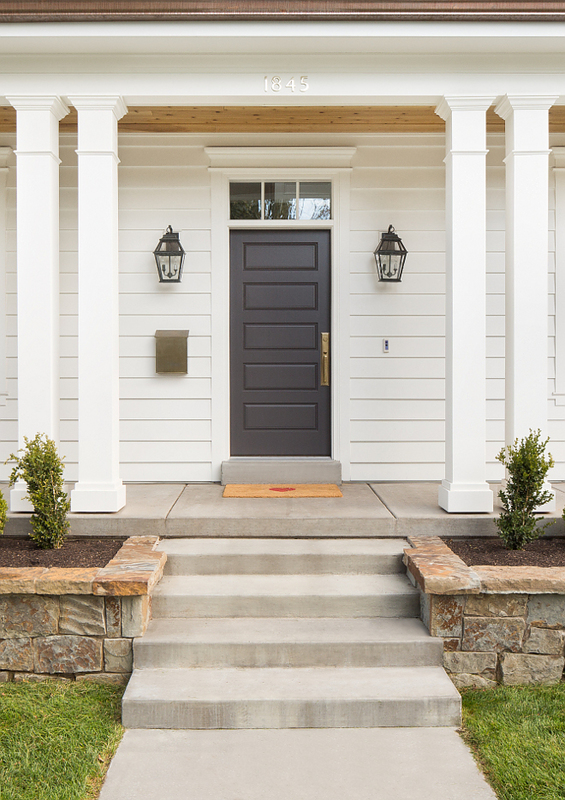 Crisp yet timeless interiors are completed with a home that features a wrap-around porch and plenty of curb appeal. Read on to know more details, paint colors and more! The builder, Tom Fox, spent countless hours redoing the scale and pitch of the roof and especially the dormers until it was the perfect scale. They look incredible, don’t they?! The roof is an asphalt – architectural style. The rain gutters are copper. 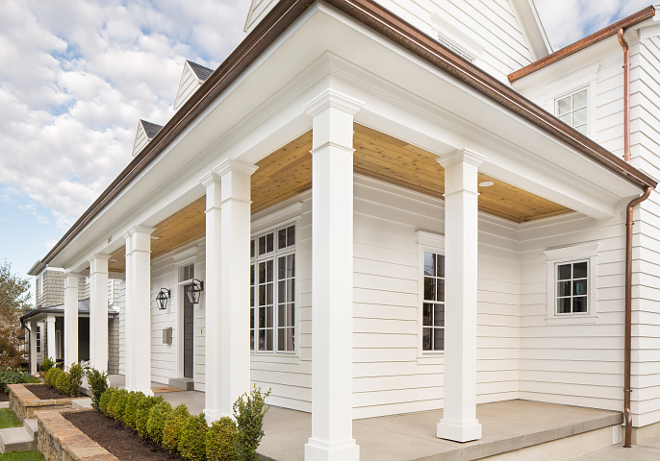 The exterior of the home is done is Artisan Hardie Boards in an 8 inch width plank. The windows are custom Pella. Paint Color: Benjamin Moore Iron Mountain. Brass Mailbox: here – Black & Brass: here. 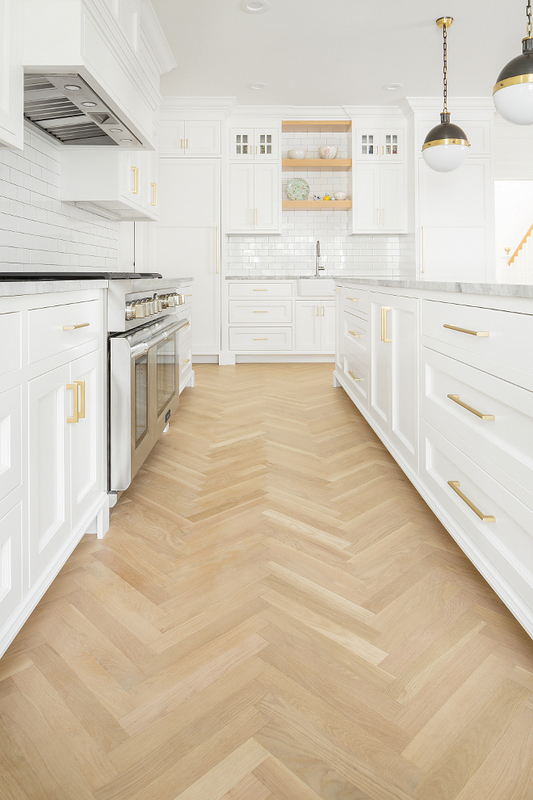 This stunning white kitchen features striking lighting and White Oak hardwood flooring in a herringbone pattern. The island dimensions are 143 inches by 60 inches. The kitchen cabinets are made of Maple. Cabinets were done by Ryan Reeder. 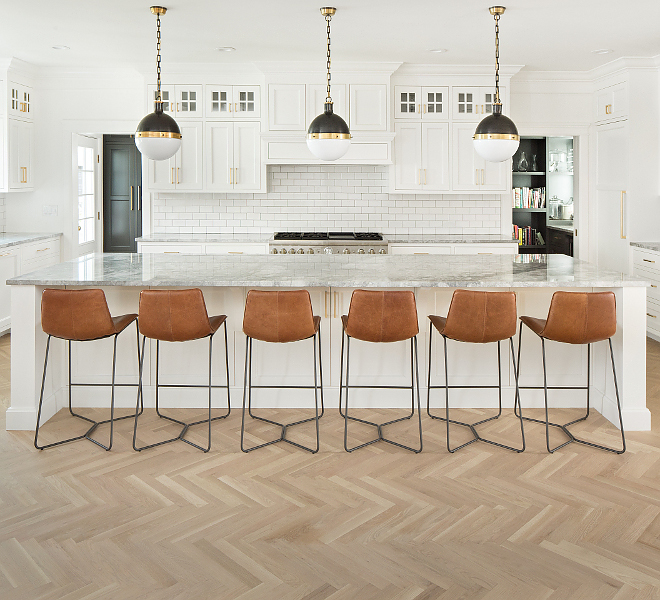 The kitchen lighting is from Visual Comfort and co. The barstools are from West Elm. 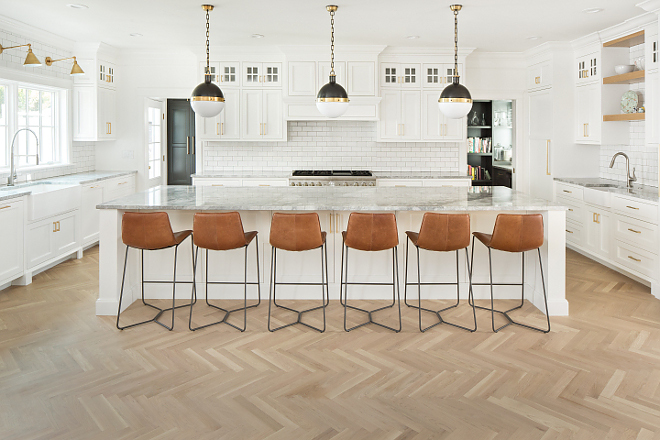 The flooring in the home is White Oak select grade in a natural matte Bona finish. 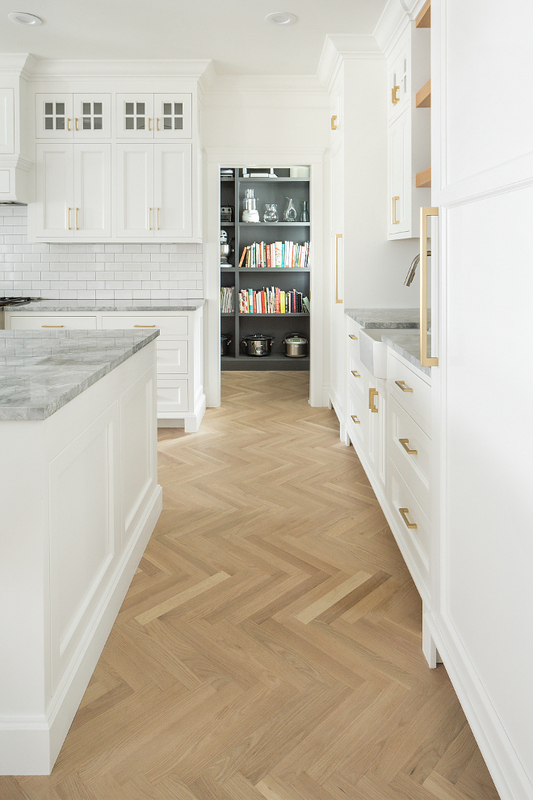 Most of the main floor was done in a herringbone pattern with 2 1/4 inch plank. 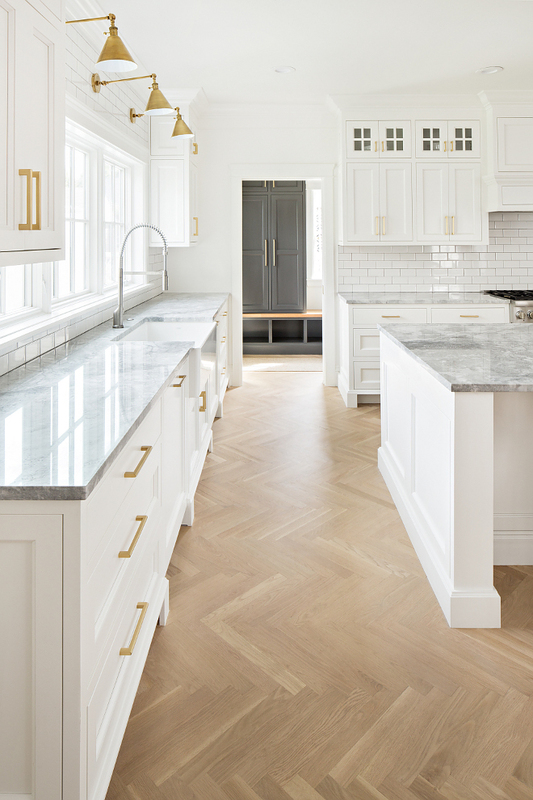 Cabinet Paint Color: Benjamin Moore Simply White. Hardware is by Emtek. This is a very popular hardware and often recommended by interior designers. 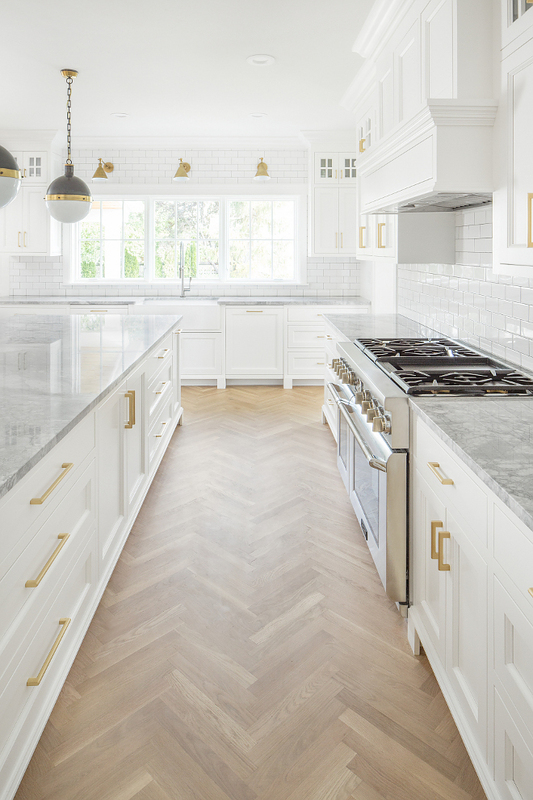 The countertops are Super White Quartzite – this stone is very durable and truly beautiful. 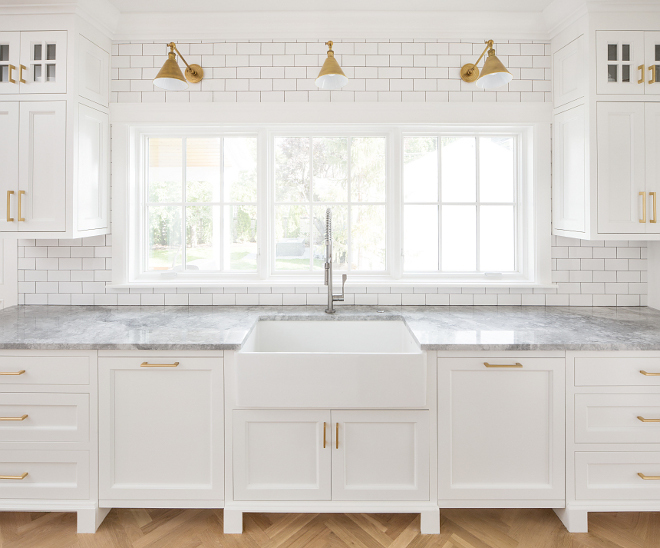 The backsplash is a traditional white subway tile. 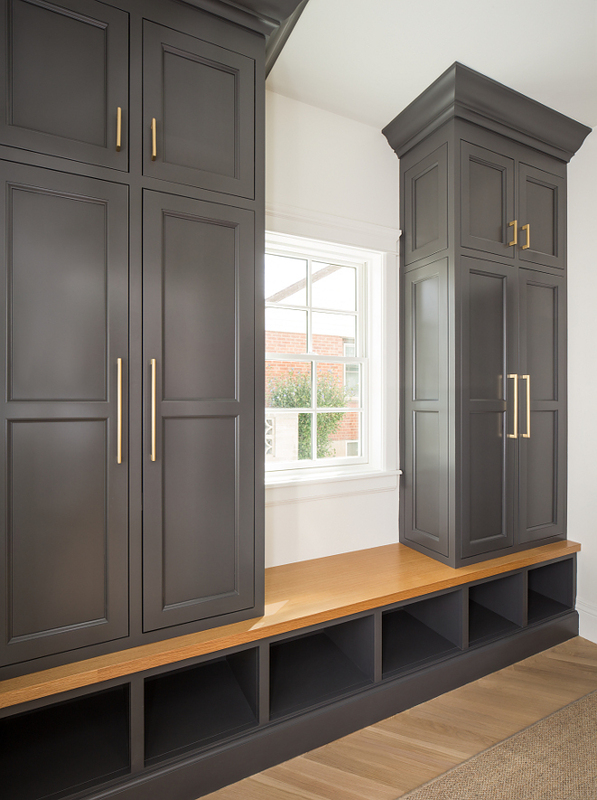 The designer accented the kitchen by painted the two connecting rooms; a mudroom on one side and pantry on other side, in Benjamin Moore Trout Gray. 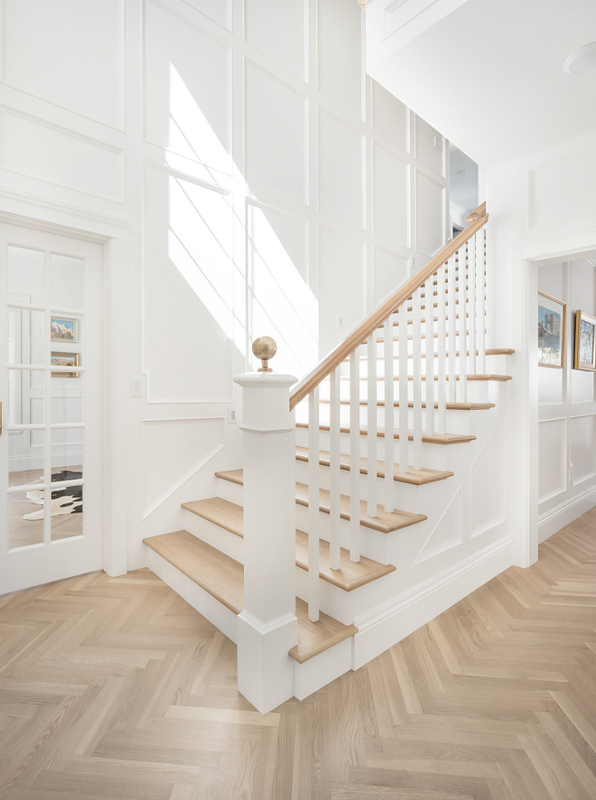 The foyer is covered with gorgeous paneling and wainscot – all painted in Benjamin Moore Simply White. 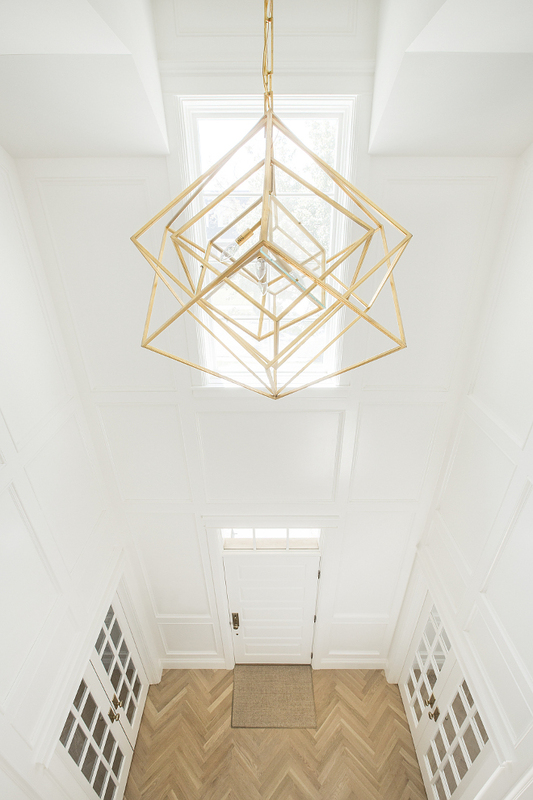 The geometric pendant is Visual Comfort Kelly Wearstler Large Cubist Gild Pendant Ceiling Light. Wayfair: Up to 70% Off CLEARANCE! HUGE SALES! Serena & Lily: Enjoy 20% OFF EVERYTHING! Use Code: NEWIDEAS! Pottery Barn: New Outdoor Sales! Interior Design Ideas: Realm Interiors.